Title: Mr. Whiston’s Primitive New Testament. 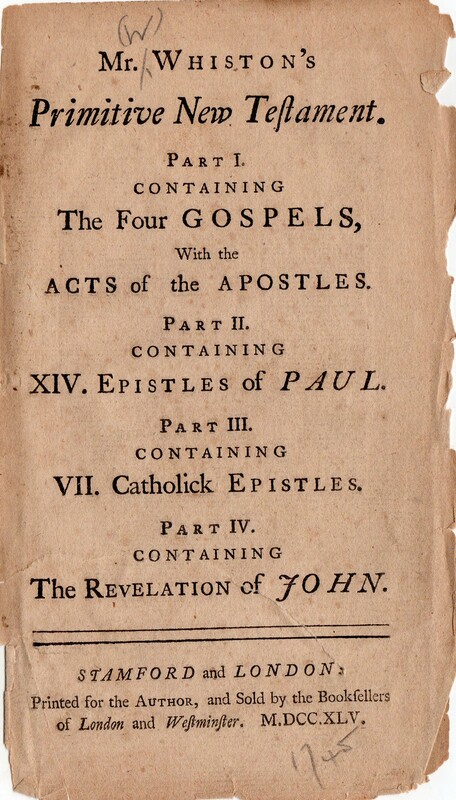 Part I. containing the Four Gospels, with the Acts of the Apostles. Part II. containing XIV. Epistles of Paul. Part III. containing VII. Catholick Epistles. Part IV. containing the Revelation of John. Stamford and London: Printed for the Author, and Sold by the Booksellers of London and Westminster. M.DCC.XLV. References: Herbert 1071, Chamberlin 538-2, Taliaferro-EELBV 7160. Location: A pdf facsimile is available at the Internet Archive Digital Library. Comments: Includes all four parts. Complete New Testament.